Vividly coloured and highly varied cichlids are some of the most truly exotic fish you can keep in your aquarium. They are noted for their intelligence and are highly sociable, making them very rewarding fish to interact with. They are also comparatively easy to breed. The first thing you need to be aware of when keeping cichlids is that they can get big - in the case of some species, up to three feet long! Because of this, and because they are mostly community fish, you'll need to have plenty of space for them. You'll also need to make sure you get the ph of the water right, as some species of cichlids come from environments with unusual water chemistry and will struggle in a neutral aquarium. Most species are happiest when they have plenty of places to hide, especially enjoying caves. Make sure you have a background picture behind your tank to give an illusion of cover, as a blank wall will make your cichlids nervous, believing they could be attacked from that side. One of the reasons why cichlids are so enduringly popular with aquarists is their fascinating breeding behaviour. You'll probably first realise your cichlids are ready to breed when their colours get brighter and they begin to chase one another. Males will expend a great deal of energy driving off rivals and trying to impress females, as well as burrowing to prepare suitable nest spots for eggs to be laid. 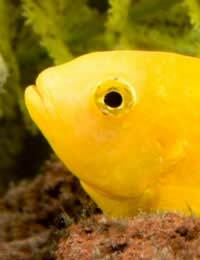 Despite all this care, however, cichlids often eat their own eggs. It is unwise to try to remove the adults to prevent this, as doing so can cause extreme stress. If it happens, be patient. Your cichlids will soon get it right, and once the fry hatch out they will be protective parents. Some species of cichlids construct hiding places for their young, whilst others protect them inside their own mouths. Because of this, they can be successful at raising them even in community tanks where there are predatory fish. However, you should be aware that their protective instincts will make them more aggressive towards your other fish, so make sure there's plenty of room within the tank for fish who feel threatened to get away. For all the difficulties involved, keeping cichlids can be extremely rewarding. Always active and interested in their surroundings, they'll provide you with plenty to watch, and they are among the most beautiful fish available for the home aquarium. I have a 6 year old jack dempsey cichlid who for the last 2 weeks seems to spend his time in the vertical position with his mouth nearest the gravel, he is always gasping for breath, but when I go to put food in the tk he always rights himself and goes for it, his body is not the best its been in - until a few weeks ago the scales and colouring were magnificent. So wot I have been doin is doing everyother day partial water changes, have been putting melafix in everyday and also top up with bacteria solution when doin the water change.Also in the tank I have 2 synadontis's and a malawi lake cichlid..and they are fine.Any ideas on what I can do for the jack dempsey without damaging the other fish.All the fish are over 5 years and are big and impressive looking.